The iOSphere quivered with anticipation as it welcomed a rumuor that the Next iPhone, whatever it will be like, draws nigh, as worker bees in Chinese factories prepare their assembly lines. Also this week, price cuts on 2-year-old iPhone models in Brazil are a harbinger of the Next iPhone; prototype photos of curved screens; wrap-around displays; and why a June 20 announcement date defies common sense. You read it hear second. Something, for sure. The Wall Street Journal, citing "people familiar with the device's production," reported this week that Apple will start producing a "refreshed iPhone similar in size and shape" to the current iPhone 5 in the April-June period. Which would mean "teeing up a possible summer launch for the next version of its flagship device," according to reporters Lorraine Luk, Jessica Lessin and Eva Dou. But a second iPhone, the mythical "less expensive iPhone" or iCheaphone, is still in the works and "could be launched as soon as the second half of this year." The newspaper seems confident it will be a "four-inch device" and "use a different casing from the higher-end iPhone." One word: plastic. And then there's this, undoubtedly the iOSphere Understatement of the Week: "Apple has been working on different color shells for the [cheap] phone but its plans remain unclear." Seriously? "Unclear" makes it sound like those plans are just right there under the surface, or waiting for a few stray clouds to lift, or full dawn to break, or the lights to come on. At this point, Apple's "plans" for the Next iPhone[s] are the iOSphere equivalent of a black hole: There is a striking absence of credible information about the features, size, design or even the name of the next phone, or about the next version of its operating system. But the iOSphere abhors, loathes, detests a vacuum and there is no lack of cliches rushing in to fill it. If you can't say anything credible about the phone, say something incredible about the company that makes it. For example, the Journal quotes Neil Mawston, an analyst at research firm Strategy Analytics, as saying, "There isn't really any major differentiator between the players at this phase." All those new smartphone buyers probably just flip a coin to decide which one to buy. "The panacea is to transform the industry with a revolutionary design." But Apple's steep and sustained growth in iPhone sales, especially over the past five quarters, show if anything the opposite: A proven design, continuously improved, creates brand trust and brand loyalty in a mass of buyers. Lacking a revolutionary design, according to Mawston, means that "you have to do the traditional business school implementations like manage costs and move quicker than your rivals." "He said [that] to cope, Apple needs to take a page from Samsung and launch more products faster," according to the Journal. Yet the story concludes by citing data, from Strategy Analytics, that in 2012, which was Samsung's best year in smartphones so far, Apple actually increased its share of the entire industry's profits, to 62%. Samsung, too, performed well: increasing its share of the profits to one-third from about 19%. And in the U.S., according to comScore's' latest data, Apple has increased its share of the U.S. smartphone market against Samsung: "133.7 million people in the U.S. owned smartphones (57 percent mobile market penetration) during the three months ending in February, up 8 percent since November. Apple ranked as the top OEM with 38.9 percent of U.S. smartphone subscribers (up 3.9 percentage points from November). Samsung ranked second with 21.3 percent market share (up 1 percentage point) ..."
As The Loop's Jim Dalrymple put it, "And Apple is losing how?" MacRumors found a Brazil website post that revealed price cuts for the iPhone 4 and 4S models. These cuts were "significant," according to MacRumors' Eric Slivka. In fact, they amounted to a 15% cut for the 4S and a heftier cut, about 25%, for the 2-and-a-half-year-old iPhone 4 model. Slivka notes that the original post "does not note the reason for the significant price cut." He himself only suggests that the price cut might be, finally, the result of Apple and Foxconn's decision to assemble iPhones and iPads in Brazil for that market, avoiding very high import tariffs. But others drew more ambitious conclusion. One commenter to Slivka's story, Plutonius, wrote, "Apple always slashes the prices to sell off inventory before a new product comes out. Brazil, India, and China will get a new low cost phone." This is one variant of the cheap iPhone rumor: that it's targeted only at, as one commenter charmingly put it, "poor countries." Inevitably, someone connected price cuts in Brazil with the Future. At Macworld UK, the headline to David Price's post read, "iPhone 4 and 4S prices slashed in Brazil: iPhone 6 coming?" Brazil prices for the most recent model, iPhone 5, are unchanged. Maybe that means something. The next iPhone will be unveiled Thursday, June 20, at a special media event (is there any other kind? ), according to a post at a Japanese tech website, Mac Fan, picked up by another Japanese tech website, Macotakara, and finally by the English-speaking iOSphere, such as MacRumors. As welcome as this hot "news," might be, MacRumors' Erick Slivka poured, dumped and deluged icy water all over it. "MacFan's specific claim of a June 20 media event seems to defy common sense on several levels," he sniffed. The problem is that Apple's Worldwide Developer Conference, WDC, which certainly qualifies as a Special Media Event, is usually held in June. He thinks it will run June 10-14. So, "it seems extremely unlikely that the company would expect the media to return for a separate media event just a week later to show off the iPhone 5S," Slivka declares. What seems extremely unlikely is the Media pouting and whining over how "we were just in San Francisco the week before and we now have to go back AGAIN?!" and boycotting the announcement of the 5S. He helpfully explains Apple's media strategy. "Even when it is running a tight schedule to launch significant numbers of new products, Apple schedules significant gaps between its announcements in order to allow each one to have its full share of publicity." Slivka doesn't seem to grasp the concept of Internet Newstime: One day is like unto a thousand years. Seven or 10 days after WDC, no one will even remember what "WDC" stands for. But there's more. "Second, Apple almost universally holds its media events on Tuesdays or Wednesdays, with the theory being that Mondays are poor days for members of the media who may need to travel to the event location the day before and that Thursdays and Fridays don't leave enough time for the full publicity impact before the news cycle is interrupted by the weekend." Setting aside the obviously flawed view of the news cycle -- namely, that a mere weekend would interrupt the world's 24/7 digital focus on the Next iPhone -- it is, frankly, heartwarming to read of a reporter's blind belief that Apple is solicitous of the Fourth Estate. The upshot is that Slivka is not optimistic about June 20 and thinks you shouldn't be either. It's "much more likely" that iPhone 5S will be announced at WDC. Or else on a Tuesday or Wednesday "at least several weeks removed from WWDC." One or the other. Definitely. And it won't have a home button! GSMArena happily posted two unauthenticated, blurry, badly lit, low-contrast photographs that were sent to the website by some guy, even though, as the post itself admitted, they "could either be photoshopped or even digitally rendered altogether." In other words, fakes. There are certain image conventions in the iOSphere. Real fake iPhones, dubbed "concept art" by the cottage industry of iPhone fan artists, are crisp, crystalline, brilliant. Fake real iPhones are invariably grainy, blurry and murky, as if none of the photographers had access to a halfway decent smartphone camera and instead were relying on an antique Kodak Instamatic whose film got messed up while being processed at the local CVS drugstore. But of course, in the iOSphere, none of that really matters. What matters is: There's something to look at. In this case, you're looking at "some interesting pictures of what is allegedly a prototype of the next Apple iPhone (5S, perhaps)." 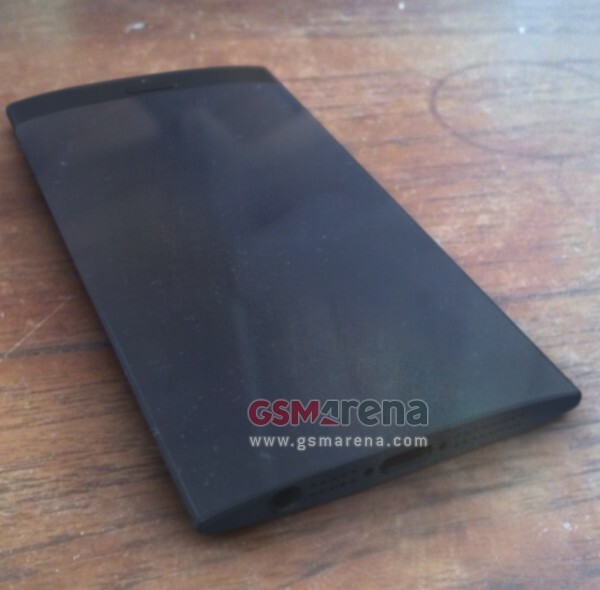 What you see is a phone that's oval in cross-section, with convex front and back. The glass face seems to extend fully to the edges; with a band of some other material across the top; the traditional iPhone physical home button is missing. There's no hint of what size the actual display screen is or what it looks like. GSMArena thought they looked familiar, and posted a drawing from a recently published Apple patent application -- for a wrap-around display (see our next item below in this post) -- showing a device that is ... oval in cross-section, with convex front and back. Some commenters thought it looked familiar, too, and one suggested that Nokia should sue Apple if this turns out to be the Next iPhone. Here's why: the Nokia 900 series, such as the 920 model, which is oval in cross-section and has a convex back but a flat screen. "However, we have to note that this kind of design isn't typical of Apple," says GSMArena, with breezy confidence. "The company tends to favor more squarish designs, which allow it to make full use of the space within the smartphone's chassis and create more compact devices." Edwin Kee, at Ubergizmo, agrees. "Still, it does not look too 'Apple', if you get what I mean," he writes. We get what he means: It clearly lacks that hard-to-define Applish quality. But then he disagrees with GSMArena, and of course with himself. "[B]ut who knows? Apple is always one company known for their radical decisions when challenging times call for it." So Apple would never create a design like this. Unless it did. As this post at The iPhone Wiki shows, the basic iPhone front appearance has so far been a rectangle with rounded corners. There have been differences in how Apple designed the sides and back of each model and in the materials used in construction. One priority in the company's design philosophy, at least according to Apple, is to ask how a given product can be improved, rather than how it can be changed. iOSpherians were quick to extrapolate. "The lack of a Home button in the photographs could indicate that iOS 7 will have more advanced gesture control functionality," extrapolated Ashleigh Allsopp at Macworld UK. As someone said recently, who knows? We're a teensy bit late with this one. The International Business Times has never met an Apple patent that it didn't loveloveLOVE for the Next iPhone. "Since patents filed by Apple were released by the U.S. Patent and Trademark Office last Thursday, many have suggested that the next iPhone may feature not only a thin and flexible display that is able to wrap around the device, but that this display will be transparent against a seamless glass chassis," posted Fionna Agomuoh. Agomuoh refers to "several other designs" given as examples in the patent, "an elongated trapezoid-shaped device and a cylindrical-shaped device," which presumably is a cylinder. 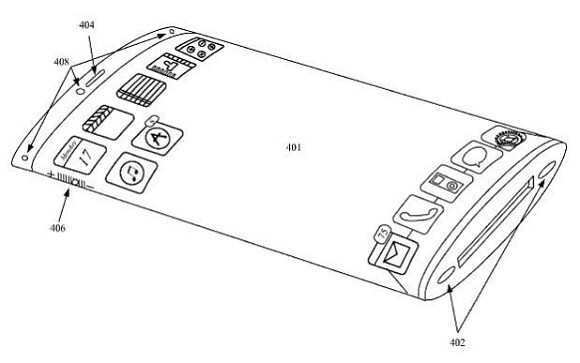 "If the patent designs are any indication, we may be looking at a new design for the iPhone 6," she concludes. Though she admits, "the idea of a transparent screen is nothing new." Indeed. But perhaps she was confusing transparent screen -- seeing as how we have to, you know, see what's on the screen, which is difficult when it's opaque -- with the "transparent chassis" celebrated by Mikey Campbell in his account of the same patent at AppleInsider. "The star of the device is its wrap-around display, which is fitted into the transparent chassis by folding, inserting, and unfolding or 'unrolling,'" he enthuses. "In one embodiment, the filing calls for a flexible display to be folded so that a continuous band is formed, on which various graphical assets like photos and video can be shown. By orienting the screen in such a manner, the invention is able to show a much broader set of graphics when compared to a smartphone." "This is certainly one of Apple's hottest inventions of the year," said an equally enthusiastic Jack Purcher, at PatentlyApple. At the risk of being thought a troglodyte, the Rollup is emphatically underwhelmed. And looking at the simple drawings in the patent doesn't help. It's undeniable that by making a handheld device's entire body into a screen you increase the surface area of the screen. But you can still only see or touch one surface bit at a time. And one-handed, or one-thumbed, use would seem to get more, not less, awkward with a wrap-around display. Maybe you could finger it like a flute, or a guitar. Or maybe the flexible foldable curvable screen is supposed to unfold from around the device. Like a flower petal blossoming. Or ... like the Origami Power Folding Stroller from 4Moms. Follow the link and click on "Watch the video."